Crystalline thin films may be grown on crystalline surfaces, but not necessarily matching atom-by-atom. Can hexagonal ferrites, a new family of multiferroic materials for energy-efficient applications, have a matching substrate? Xiaoshan Xu and and his team the University of Nebraska-Lincoln certainly think so! Professor Xu’s work was recently featured in the Journal of Physics: Condensed Matter Emerging Leaders special issue, highlighting the very best early career researchers across all of condensed matter physics. Read on to find out more from Professor Xu. Hexagonal ferrites have been recently identified as a family of complex oxides that are both ferroelectric and ferromagnetic. The predicted magnetoelectric effect due to the coexisting ferroelectricity and ferromagnetism in hexagonal ferrites makes them promising materials for energy-efficient information storage and processing. Hexagonal ferrites are unstable as stand-alone materials, but can be stabilized on substrates of trigonal or hexagonal symmetry as thin films. On the other hand, the existing substrates for hexagonal ferrites, i.e. aluminum oxide, yttrium stabilized zirconia, and platinum, all have a large mismatch in terms of crystal lattice sizes. This introduces a significant number of defects at the film/substrate interface, undermining the study of the intrinsic properties of hexagonal ferrites and their applications. Therefore, it is imperative to find a substrate material for the hexagonal ferrites with matching crystal lattice, to study the intrinsic material properties, and to exploit the properties at the film/substrate interfaces. Taking advantage of our recent work on epitaxial growth of Fe3O4 (111) on Al2O3 (001) with high crystallinity and smooth surface of atomic terraces, we hypothesize that Fe3O4 (111) could be a matching substrate for hexagonal ferrites because of the less-than-1% difference between the in-plane lattices of the two lattices, and the fact that an atomically flat Fe3O4 (111) surface can be created. Electron diffraction images of different surfaces with two perpendicular directions of incident electron beams relative to the substrate. In (a), (c), (e), and (g), the orientation of the substrate is fixed so that the electron beam is parallel to Al2O3 . In (b), (d), (f), and (h), the orientation of the substrate is fixed so that the electron beam is parallel to Al2O3 . The alignment between the electron beams and the films lattices are also indicated. (h) Crystal structure of h-RFeO3. Taken from J. Phys. Cond. Mat. 164001 © IOP Publishing 2017. We grew hexagonal ferrite (h-RFeO3 R=Lu, Yb) thin films on Fe3O4 (111)/Al2O3 (001) substrates, and studied the effect of the h-RFeO3 (001)/Fe3O4 (111) interfaces on epitaxy and magnetism. The observed epitaxial relations between h-RFeO3 and Fe3O4 indicates an unusual matching of Fe sub-lattices rather than a matching of O sub-lattices. 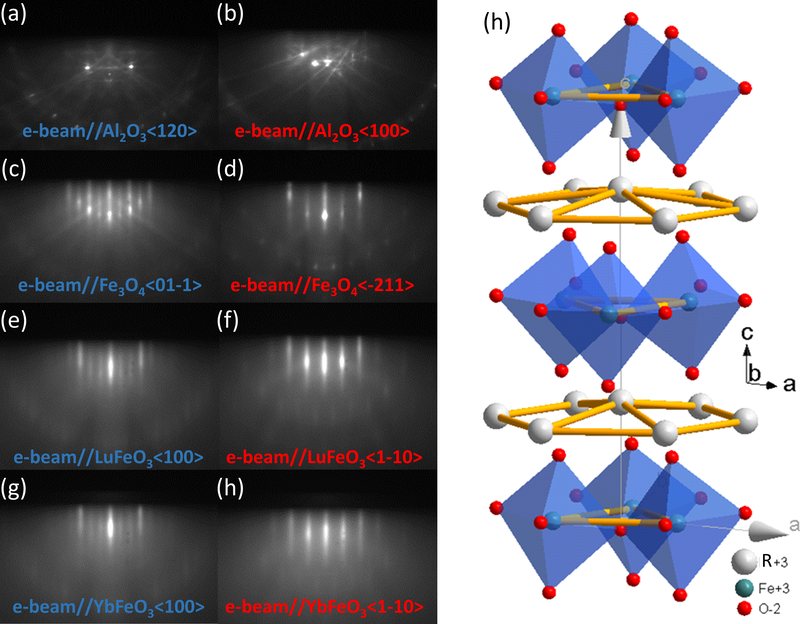 The out-of-plane direction was found to be the easy magnetic axis for h-YbFeO3 (001) but the hard axis for Fe3O4 (111) in the h-YbFeO3 (001)/Fe3O4 (111)/Al2O3 (001) films, suggesting a perpendicular magnetic alignment at the h-YbFeO3 (001)/Fe3O4 (111) interface. These results indicate that Fe3O4 (111)/Al2O3 (001) could be a promising substrate for epitaxial growth of h-RFeO3 films of well-defined interface and for exploiting their spintronic properties. Furthermore, the conductive nature of Fe3O4 will be beneficial in studying the multiferroicity of h-RFeO3 in an electric field, especially theoretically proposed voltage controlled switch of magnetizations. This work is part of our on-going effort to study the growth, epitaxy, and the multiferroic and magnetoelectric properties of hexagonal ferrites, as well as to exploit the spintronic applications of hexagonal ferrites via interfacing with other oxide materials. This work was carried out in the Thin Film Material Group at the University of Nebraska-Lincoln, United States., The leader of the group, Dr Xiaoshan Xu, is an assistant professor in the Department of Physics and Astronomy and a faculty associate of the Nebraska Center for Materials and Nanoscience. 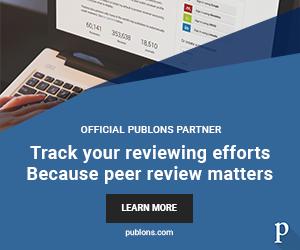 The research interests of the group include epitaxial complex oxides films and organic semiconductors heterostructures, focusing on their ferroelectric and magnetic properties. This project was primarily supported by the National Science Foundation (NSF), DMR under Award DMR-1454618.